MovieScore Media presents another exciting documentary score score for ITV’s latest travelogue, Joanna Lumley’s Trans-Siberian Adventure with music by Miguel d’Oliveira. 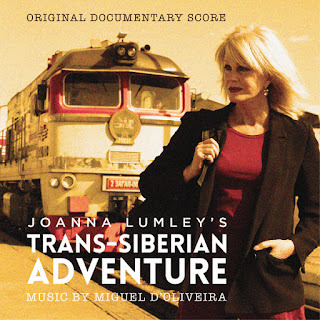 The 3-part series follows British actress Joanna Lumley (of Absolutely Fabulous fame) on a trip from Hong Kong to Moscow through China, Mongolia and Russia. During her trip, Joanna revisits her childhood home where her father was stationed, then she travels thousands of miles, visits the obligatory tourist sites (such as the Great Wall of China) and also makes a few unusual stops (such as meeting a shaman in Mongolia). The soundtrack release coincides with the program’s debut on ITV on July 12, 2015. “Early on this project, director Michael Waldman and I decided that, instead of emulating all the musical idiosyncrasies of the vastly different countries and territories Joanna travels through, the score should seem as if we were hearing everything through her“ explains the composer about the score. "This is why the music has a very British / Western hemisphere flavour, as opposed to a collection of rough guide tracks." The unique ensemble consists of the composer playing nine different instruments (guitars, piano, viola, cello, clarinet, dulcimer) accompanied by soloists for piccolo, cor anglais, violin and cello. Several tracks also have a hint of Eastern sounds (particularly Tuvan throat singing) plus Russian and Chinese instruments complimenting the exotic stops of the Trans-Siberian Adventure. Following his graduation from medical school, composer Miguel d'Oliveira taught himself music and became a multi-instrumentalist playing in several ethnic and jazz bands as well as symphonic orchestras. After scoring his first short for a film school graduate, he completed an MA in Composition for Film at the National Film and Television School. The composer’s credits include the horror film The Toybox (2005) and documentaries on numerous interesting subjects such as The Bible: A History (2010), The Viking Sagas (2011), The Ground Zero Mosque (2011) and The American Road Trip: Obama's Story (2012). Like Trans-Siberian Adventure, each of these scores highlight the composer’s unique ability in melding exciting ethnic elements with a symphonic sound.